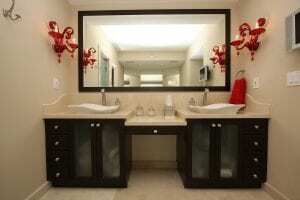 Take a close look at the bathroom mirrors in your Orlando home. Are the frames really to your taste? Are the mirrors distortion-free? At 31-W Insulation, we believe that too many bathroom mirrors are designed and crafted as afterthoughts. Just about every home has a bathroom mirror, so why shouldn’t it enhance your décor while also being exceedingly functional? To that end, we offer handcrafted mirrors from Gardner Glass Products, a leading manufacturer for more than 50 years. We can come to your Orlando home to discuss your needs and tastes, and review all of the features and options of our bathroom mirrors. Once you’ve made your selection, you can expect nothing less than flawless installation as our technicians are our extensively trained employees with many years of home improvement experience. And, for your peace of mind, we offer a one-year warranty on mirror installations in addition to the manufacturer’s warranty. Contact 31-W Insulation today to learn more about our bathroom mirrors or to schedule a free consultation.